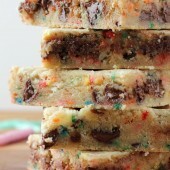 Soft and chewy homemade blondie bars, studded with chocolate chips and rainbow sprinkles. Preheat oven to 350°F. Lightly grease the sides of a 9x13 baking pan and line with parchment paper, leaving extra overhang to grab with later. In a large bowl or stand mixer, beat butter until fluffy. Add sugars and cream together with butter. Mix in eggs and vanilla, followed by salt, baking powder and flour. Mix, increasing speed as needed, until batter is smooth and no streaks remain. With mixer running on low, add sprinkles, mixing until just dispersed. Mix in chocolate chips by hand. Press batter into prepared pan, creating an even layer. Lightly grease hands if needed to prevent sticking or use a butter wrapper. Bake for 25 minutes or until edges are just golden. Cool in pan on a wire rack. Remove blondies by grabbing parchment overhang. Place on a cutting board to cut into desired sizes. Store in an airtight container. Recipe serves 12-20, yields 1: 9x13 pan.